Work is well underway on radical electric versions of Porsche’s upcoming new executive saloon. Autocar can reveal that there will be both battery electric and hydrogen fuel cell versions of the new BMW 5 Series rival and that their powertrain will be mounted in the rear. Autocar has uncovered much of the engineering thinking behind this new car from a series of patent applications filed in Germany, China and the US. Ulrich Hackenberg, R&D boss of Porsche’s parent company, the Volkswagen Group, gave teasing details of Porsche’s radical plans for electrified cars at a press gathering on the night before VW’s annual conference in March. At the event, Hackenberg surprised industry observers with additional plans for a hydrogen fuel cell vehicle. Porsche’s Panamera Sport Turismo – which was first revealed in 2012 – is said to give strong clues about the look and size of the new model line. 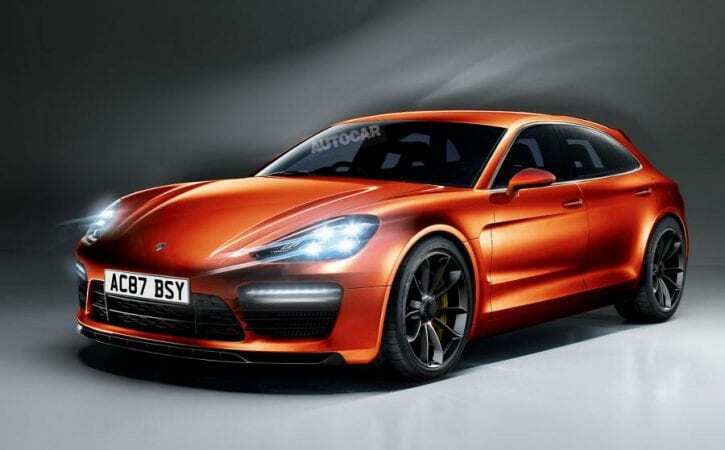 The patents show that the Porsche EVs will sit on a substantially new structure, although it is based on an adaptation of the upcoming MSB platform, which will be used for the new Panamera, future Bentley models and the new Porsche executive saloon, known as the Pajun. The battery-powered version will have at least a Tesla-matching 420bhp, but there’s no clue yet about when it will arrive in showrooms. The best estimates suggest a market introduction in late 2017 or early 2018. The version powered by a fuel cell stack looks likely to arrive in limited-production runsshortly afterwards. There’s no news on the likely range of the EV, but it will at least match the 265-mile US government rating achieved by the Tesla Model S. It’s possible that the battery electric version of the car will be called the Porsche 718 and the fuel cell version 818. The clever packaging of the new car also makes it easy to produce it in both battery and hydrogen-powered forms. This will give Porsche a big cost advantage compared with existing fuel cell vehicles such as Toyota’s Mirai, which uses a bespoke platform. Porsche engineers have decided not to try to adapt an existing platform (like Nissan’s Leaf) or build a completely new platform (as start-up brand Tesla did). Instead, they have cleverly adapted the new MSB platform by carrying over the front and rear crash structures and the longitudinal members (or sill structures) and then substantially modifying it to accommodate batteries and rear-mounted motors. According to the uncovered patents, which were filed in December last year, Porsche engineers have designed a new structural rear-mounting system for the electricdrive motors. This makes the powertrain itself part of the ‘eMSB’ structure, which will help to stiffen the rear end, improve the overall rigidity and ensure resilience in a rear-end impact.In addition, company engineers have patented something called an ‘impact plate’, which is also part of the platform’s new structure. These plates will be fitted between the battery cells, running across from one sill structure to another. This will give the floor greater rigidity and improve side impact performance. The batteries themselves use ‘pouch cells’ and are mounted in rigid frames. At the front – where the conventional subframe would be a vital part of the car’s safety structure and essential to the rigidity needed for good suspension control and steering accuracy – Porsche engineers have designed a new, patented “supporting frame” with “a crossmember and stiffening struts running diagonally… to form a load path that runs obliquely”. The rear-mounted electric powertrain is expected to be similar in principle to that used in the Audi R8 e-tron, with two motors, one for each rear wheel. However, the Porsche design is more advanced. Decoded from the patent language, this all-in-one unit is unusually compact and can be mounted low down. (The centre line of the electric motors is well below the centre line of the car’s rear wheels.) This means the car should have reasonable boot space, even with the electric control unit mounted above the motor. Porsche will also be able to retain an independent rear suspension system and the twin rear motors will be able to deliver a significant amount of torque vectoring, greatly aiding turn-in. This rear-engined arrangement is not only relatively space efficient but also means there’s room under the bonnet for a fuel cell stack. Even so, no engineering detail has yet emerged on how Porsche will be able to package gas tanks and a small battery pack into the eMSB architecture. With all the re-engineering going into the drivetrain and lower structure, the rest of the new car will be much closer to its internal combustion-engined sister model. The upper structure, most of the exterior skin and interior will be shared with the Pajun. However, it’s thought the EV will get distinctive nose and tail treatments, as well as changes to the instrument cluster. Porsche is also developing its own induction charging system to allow the battery pack to be topped up without the need for cables and heavy-duty sockets while parked at the owner’s home. The EVs are expected to be popular on the west coast of the US, in China’s biggest cities (where there is a big push to ‘new energy’ vehicles) and other Asian wealth hotspots.